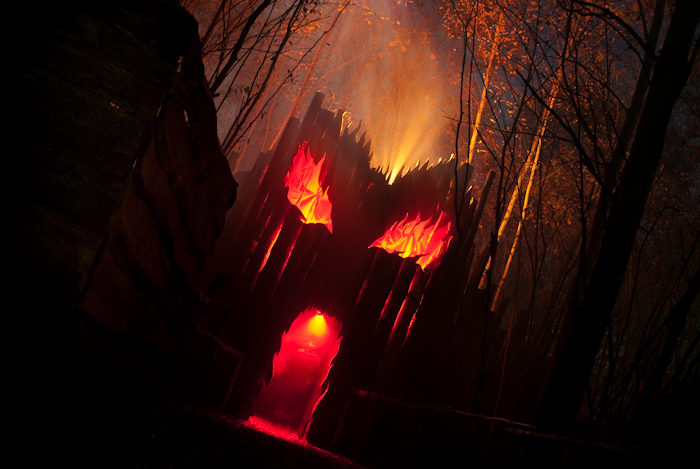 After attending Haunted Overload the past two years and subsequently writing about my experiences both times, I wasn't sure that there would be anything left to say about this stalwart of the haunt industry. Last year saw fantastic progress for Haunted Overload, featuring a longer trail with all sorts of new set pieces and effects; it seemed like another annual review would hardly be necessary. If you've read my past reviews of the 2008 and 2009 seasons, then you know my opinion that Haunted Overload is the physical embodiment of the very essence of Halloween. I had resigned myself to the fact that there seemed to be little left to say about the fantastic and terrifying Halloween experience that is Haunted Overload. And then, the unthinkable happened. Haunted Overload lost its home. 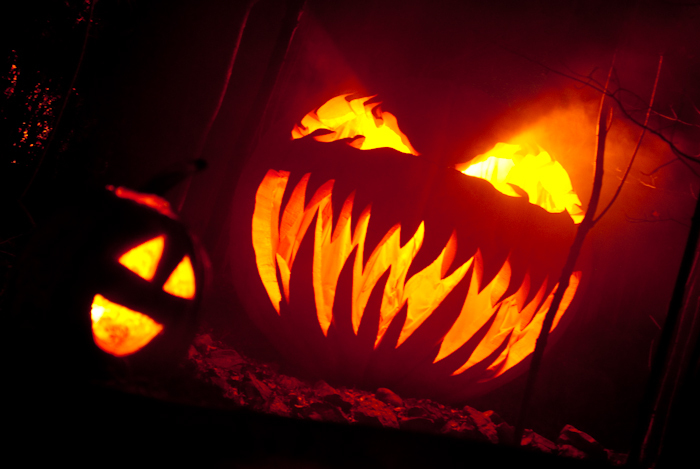 For the past three years haunt mastermind Eric Lowther had been staging the event at the Coppal House Farm in Lee, New Hampshire. It was around the second week of April when I heard the news- Haunted Overload would not be able to return to Coppal House for the 2010 Halloween season. I was genuinely upset at first, but good news was right around the corner. Within a matter of weeks, Haunted Overload was able to secure a new venue, that of DeMeritt Hill Farm, also located in Lee, NH. Despite this stroke of luck, the immediate implications were staggering- Eric and crew would only have six months to build an entirely new haunted trail. 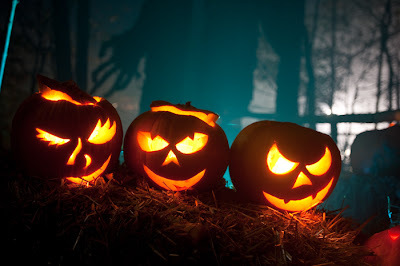 This may come as a surprise for the casual haunt fan, but professional haunted attractions are typically year-round endeavors. The moment a haunt closes following the Halloween season, work begins on next year's edition of the haunt. Six months is simply not a lot of time in this industry. Even with having secured a new location, I honestly wasn't sure that moving Haunted Overload would happen in the time-frame that remained. For Haunted Overload to return in 2010, and for it to be anything other than a ghost of its former self, it seemed like a Halloween miracle would be needed. Despite being a holiday typically associated with the supernatural, the only miracle that occurred at Haunted Overload was good, old-fashioned hard work. It is clear that many long weekends and sleepless nights were contributed by a great many talented individuals. Collectively, they have managed to achieve the miracle that Haunted Overload needed. There is no greater testament to the skills and dedication of the Haunted Overload crew; the new haunt already looks like several years of work have been put into its creation. The elaborate sets, the detailed props, the giant monsters, the expert lighting- they're all still here. Haunted Overload is awesome as ever and, dare I say, better than ever before. The new location is a big part of what elevates the new Haunted Overload over previous annual editions. The land set aside for the haunt takes the patron down a forty-minute trail deep into the woods. There is no manufactured substitute for the primal dread that comes from walking through the woods at night. Take away the actors and the impressive sets, and the woods are still genuinely scary in their own right. 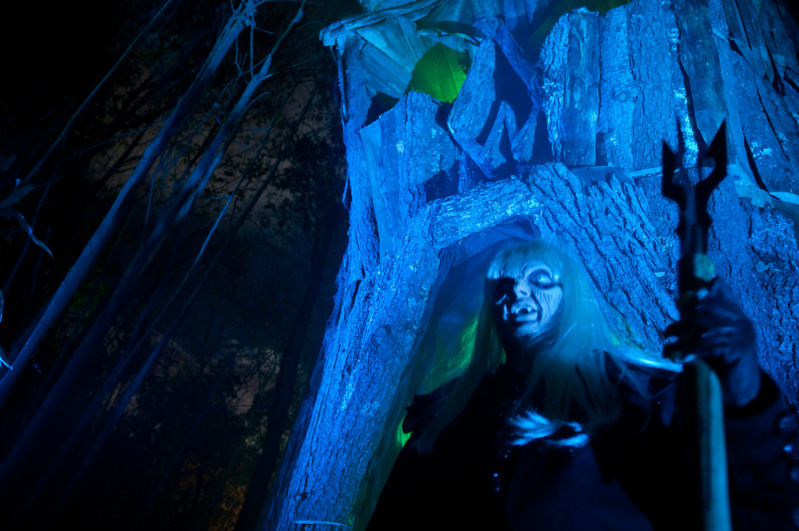 Dripping with this natural atmosphere, the woods at DeMeritt Hill Farm are the perfect place to set an outdoor haunted attraction. The move to a new physical location practically necessitates that every major set-piece is a brand-new construct. Although I missed several of the previous large set pieces, the clown tent and vortex tunnel in particular, the new buildings definitely make up for those left behind. The new main gate through which patrons enter the haunt is especially impressive. 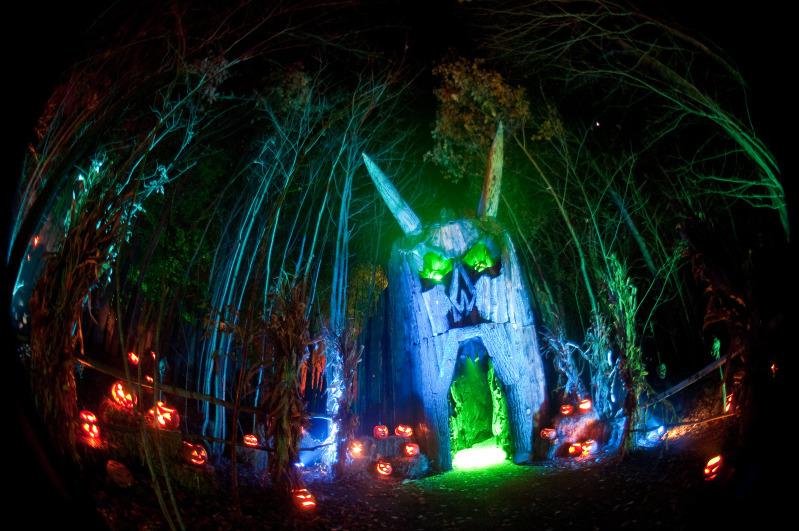 The towering facade displays the glowing visage of a demon, its giant horns towering over the beautiful, eerie lights of pumpkin alley. Other notable set pieces include an off-kilter shack whose wildly exaggerated angles wreak havoc with your sense of balance, and a spooky old mineshaft whose downwards sloping entrance makes it seem as if you're actually headed under the ground. The quality doesn't end with the buildings. Many of the highly detailed props and giant monsters made the move to Demeritt Hill, and they're accompanied by some brand new brothers and sisters. 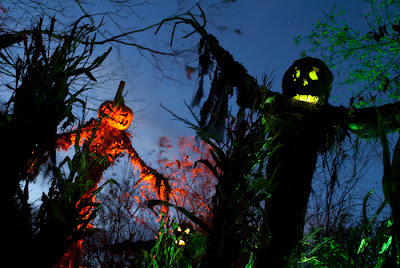 For those of you that have never attended, there's simply nothing else in the industry like the thirty-foot tall monstrosities that loom over Haunted Overload. Smaller siblings are also abound, with the fully-articulate, twelve foot-tall Death Stalkers returning from last year, and similarly sized scarecrow-like monsters making their debut. I really liked the dark, amorphous faces and hand-sharpened stick teeth of these latter creations. Other notable pieces include chainsaw-carved trees; artful sculptures with ghastly contorted evil faces. 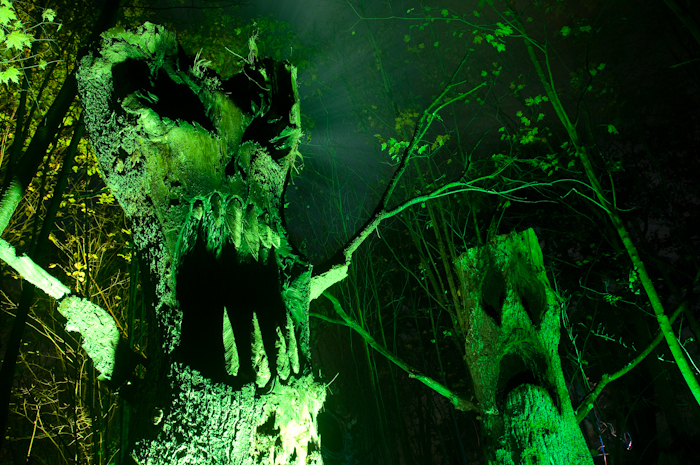 These tree-monsters are wildly imaginative, looking like something out of a Hollywood movie when lit up at night. The monstrous trees are definitely one of my favorite ideas on display at Haunted Overload and, to my delight, they are placed directly in the center of the walking path, allowing me to appreciate their finer details as I passed by. Having made known my appreciation for the inanimate elements of Haunted Overload, I want to give credit to the flesh and blood that help bring the haunt alive each night. The trail itself is a spectacle to behold, but without the volunteers and actors it would feel like an empty tomb- disquieting, but not terrifying. The costumed denizens of Haunted Overload complete the experience, engaging the patron and perpetually keeping them on their toes. Moving beyond the superficial costumes and make-up, both of which are top-notch, I've been consistently impressed with the actors' performances. Haunted Overload is one of the few haunts where the actors are seemingly well-coached and encouraged to fully realize their characters. Some of the actors will speak to you and engage in conversation, while others remain completely silent. Depending on their character, actors may imitate animals, mumble incoherently, or simply even gasp or hiss. These performances are appreciably varied, breaking the trend of simply screaming until hoarse, an annoyance all too commonly found at other haunts. The use of low noises, breathy gasps and raspy growls almost too low to be sure I even heard them, are unsettling in ways that really add to the atmosphere of the haunt. Actors aren't afraid to work together either. More than once I witnessed an actor pass up their opportunity to scare and to serve as a misdirection of the patron's attention while their unseen comrade moved in for the kill. Teamwork like this ensures that the scares are constantly flowing and really helps elevate the overall experience. I can think of no greater praise than this: Having worked in the industry for several years and having attended half-a-dozen haunts during the 2010 season, the only place that made me scream was Haunted Overload. Special kudos to all involved! Given the hardships that proceeded the 2010 season, I was thrilled to see Haunted Overload rise above and provide the quality Halloween experience for which they are known. The silver lining is now clear- Eric Lowther and the rest of the Haunted Overload crew have an entire year to expand and improve the new trail at DeMeritt Hill Farm. With the basics now established, it is time to see what new horrors the creative minds at Haunted Overload dream up next. I look forward to being surprised, startled and scared in 2011- and you should too! Did you attend Haunted Overload in 2010? Feel free to add your comments below! All images courtesy of Eric Lowther at Haunted Overload and Artifact Images. Couldn't attend this year's event, but had the great pleasure of seeing his work last year. Glad you enjoyed the article. Thanks for the link from your site! Awesome review! Getting ready to do an interview with Eric myself. Going to use this review in my links!! Thanks for your information. Thanks, Brian. Hope the interview turns out well, Eric is really great guy. If the interview is for an article online, feel free to drop a link to it in the comments here!